With pretty diamond cut leaf detailing, this stylish 9ct white gold locket is the perfect place to keep a photo of a loved one close to your heart. 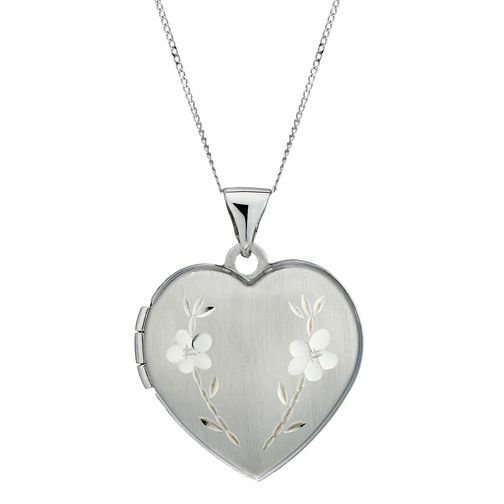 9ct White Gold Diamond Cut Heart Locket is rated 4.0 out of 5 by 5. Rated 5 out of 5 by Anonymous from Bought better chain with! Yes chain is very thin so upgraded it, so have 2 now for this lovely locket. I picked this for my Christmas present but not a huge jewellery wearer. I prefer white gold as my wedding ring set are and they are wearing well. Another Hsamuel purchase. They provide good service and don't pressure you to buy. Locket will be of sentimental value with special contents, with a very attractive flower design. Rated 1 out of 5 by Anonymous from Poor product Rubbish. Cheap not worth the price it’s at. Also arrived with a knot in chain.. would not recommend buying!